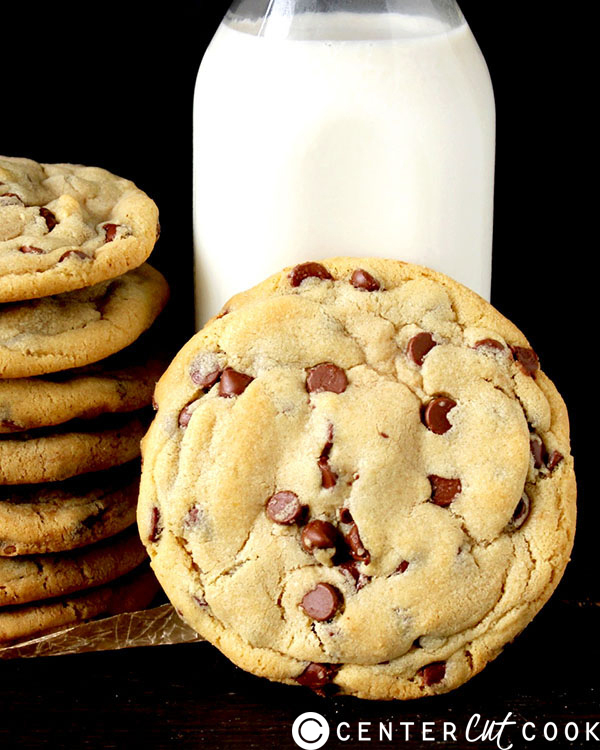 These Jumbo Chocolate Chip Cookies are easy, delicious, and the perfect indulgence! What’s better than a chocolate chip cookie?? A jumbo chocolate chip cookie!! 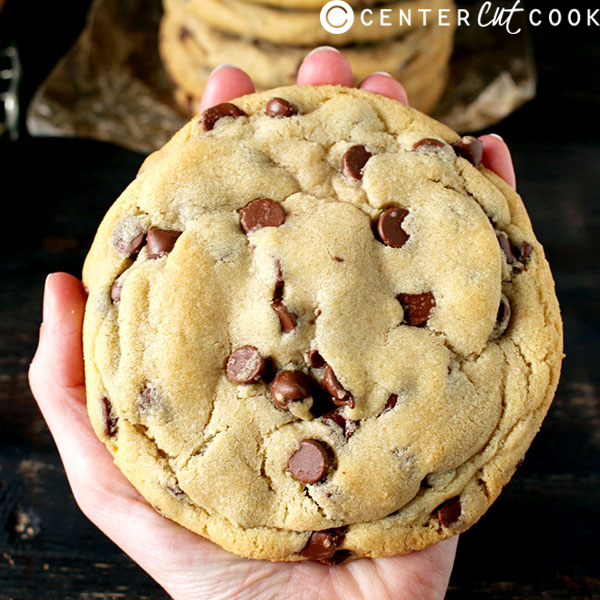 These cookies are seriously big- each one made with 1/2 cup of cookie dough and the end result is a cookie and big as your hand! The whole batch only makes 6 cookies, and they aren’t only wide, but they are also thick. This is not a flat, thin cookie. It is soft, chewy, and everything you want in a cookie! Just like my jumbo sugar cookies! They are so easy to make! The dough is made in just a few minutes and it doesn’t need any chill time. Also, they are mixed by hand so you don’t even have to worry about getting the mixer out. They have become my go-to chocolate chip cookie because they are so simple and I know you will love them just as much! I use milk chocolate chips in these, but use whatever your favorite is- semi-sweet, dark, or chunks. Any type would be delicious! These are perfect for giving as gifts. Who wouldn’t love a chocolate chip cookie? Especially when it’s this big! Preheat oven to 350° and line 2 sheet trays with parchment paper. Set aside. In a small bowl, combine flour, cornstarch, baking soda, and salt. Stir and set aside. In a large bowl, combine butter, brown sugar and granulated sugar. Mix until fully combined. Add in the egg and vanilla and mix well. Stir in the flour mixture and mix until no dry pockets remain. Measure dough into 1/2 cup portions using a measuring cup. It should make 6 large cookies. Roll balls so they are smooth and place 3 on each sheet. Bake 1 tray at a time, for 17-18 minutes. They will still be soft when they come out so let them cool on the sheet tray for 5-10 minutes.